Building community is key towards the development of effective teaching and learning about the world around us. 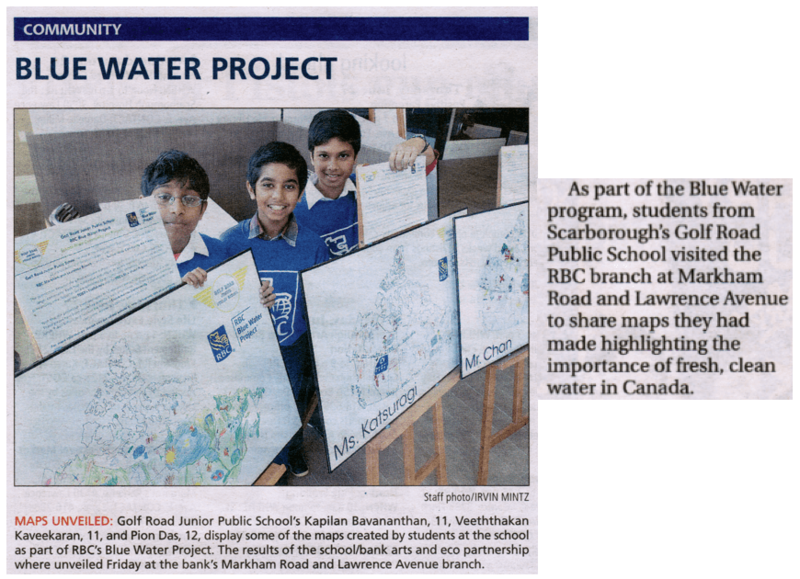 Golf Road Junior Public School has partnered with the newly relocated RBC Markham and Lawrence Branch to create a School-Wide Community Art Project that focuses on just that – connecting, collaborating and educating through a local partnership. Initiated by Golf Road’s School Council and funded by a generous donation by the RBC Markham and Lawrence branch, students and teachers worked together to create art pieces in each of the Grade 1 to Grade 6 classes. 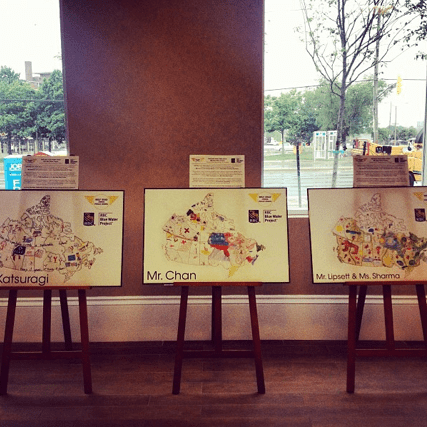 These pieces focused on the theme of Environmental Sustainability, reflected in the missions of both the TDSB’s EcoSchools and the RBC’s Blue Water Project. Created collaboratively, each piece represents a common goal shared by all, showing that our community connects us. The link between the school and bank is illustrated in using the map of Canada, reflective of our larger community. Each map is individual and unique, as are the members of our school and the surrounding area. With this, the art project has been developed as 10 separate classroom art pieces, each 2’-by-3’ in size, created using a variety of media. After students created these pieces on paper, photographer Matthew Bennett digitally captured them. Once photographed, the team at Paragon DPI worked to include the Golf Road and RBC Blue Water Project logos after properly cropping and mastering the images. The final pieces were printed and mounted for display. 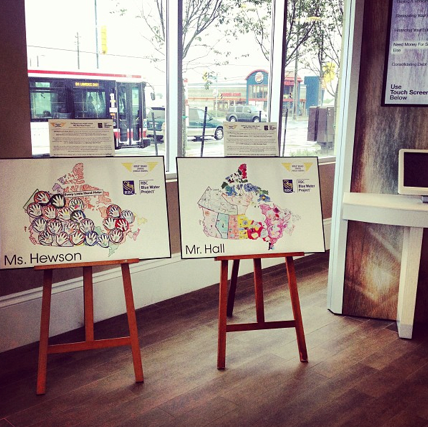 These pieces have been showcased at the RBC Markham and Lawrence Branch during the RBC Blue Water Project week (Monday, June 10th, 2013 – Friday June, 14th, 2013). 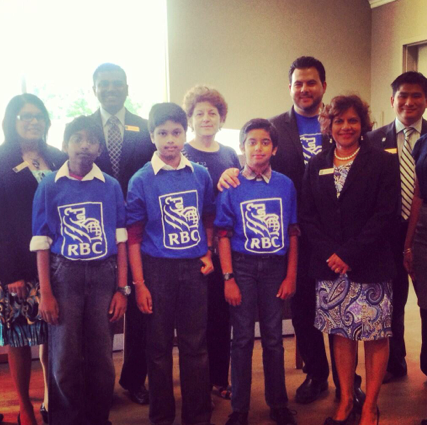 On Friday, June 14th, Golf Road’s ECO Team had the great privilege of sharing their learning and work while at the branch as they acted as Golf Road and RBC Blue Water Project Student Ambassadors! A true display of community and collaboration, these places will be on permanent display in the halls of Golf Road Junior Public School for all to learn from and enjoy.